From its founding in 1941, the American Institute of the History of Pharmacy has prioritized the collection and preservation of historical material related to the history of pharmacy. Over the years, AIHP has acquired, maintained, and made available to researchers numerous important pharmaco-historical collections. AIHP still actively seeks donations of collections related to the history of pharmacy. Please see our donations page for more information about donating collections or artifacts to AIHP. Researchers interested in accessing AIHP collections (except for the AIHP Collections at the Wisconsin Historical Society) should email AIHP (research@aihp.org) to arrange a time to consult the materials. Researchers interested in reviewing the AIHP History of Pharmacy Archives Collection at the Wisconsin Historical Society, should directly contact the Wisconsin Historical Society Archives. The Kremers Reference Files (KRF) is AIHP’s primary on-site research collection. The KRF collection began as the research notes compiled by UW Professor Edward Kremers for his unpublished Encyclopedia of Pharmacy and has been maintained by subsequent AIHP directors. The KRF contains biographical material and other historical records, including: letters, organizational records, prescriptions, pictures, photographs, pamphlets, circulars, advertising, artifacts, ephemera, and other similar material. The Drug Topics Photograph Collection consists of the photograph morgue of Drug Topics magazine, which contains more than 17,000 photographs documenting the profession of pharmacy from about 1945 to 1970. The Cowen Reference Files consists of the research material gathered from 1955 to 2006 by pioneering historian of pharmacy Professor David Cowen, of Rutgers University. The Cowen Reference Files contains both primary and secondary sources related to Professor Cowen’s long career researching and writing about the history of pharmacy. The Metta Lou Henderson Women in Pharmacy Collection consists of the research material gathered by Dr. Metta Lou Henderson for her groundbreaking research about the history of women in pharmacy. To arrange a visit to see materials in the above collections, please email research@aihp.org. 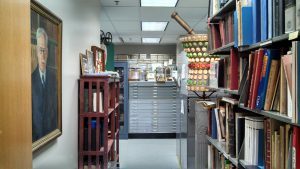 The AIHP History of Pharmacy Archives Collection at the Wisconsin Historical Society contains the bulk of the manuscript and archival records collected over the years by AIHP. Available collections include the personal papers of prominent individuals like Robert P. Fischelis and Rufus Ashley Lyman and organizational records, including the American Association of Colleges of Pharmacy, the American Council on Pharmaceutical Education, the National Association of Boards of Pharmacy and the United States Pharmacopeial Convention. See the full list of available collections. The AIHP History of Pharmacy Archives Collection is not housed at the AIHP offices in Rennebohm Hall at the University of Wisconsin School of Pharmacy. The American Institute of the History of Pharmacy Archives Collection is housed at and maintained by the Archives of the Wisconsin Historical Society. Researchers who wish to consult these materials must visit the Wisconsin Historical Society Archives (816 State Street) and make the necessary arrangements with the WHS Archives staff.